The United States Army uses military awards and decorations to symbolize accomplishments by its soldiers, both for non-combat related duty as well as heroism in combat. The first medals and ribbons were issued to Army soldiers during the Civil War. These were unofficial awards given by individual commanders. The first official award established in the Army was the Congressional Medal of Honor, which is the highest medal of distinction. 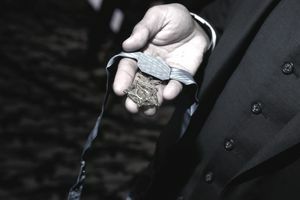 A medal will not be awarded or presented to any individual whose entire service after the time of the distinguished act, achievement, or service has not been honorable. The determination of "honorable" us based on honest and faithful service according to the standards of conduct, courage, and duty required by law and customs of the service of a member of the grade to whom the standard is applied. The Army separates unit citations and awards from individual awards. When facing a soldier, the individual awards, medal, and badges that person earned will appear on your right (his/her left) side of the chest. The unit awards and citations will be on your left (his/her right) side of the chest, above the name tag. The unit awards are encased in a gold frame that wraps around the ribbon. It is often stated incorrectly that someone who serves "won a medal of honor," or was a "medal of honor winner." It should be noted that no one "wins" a medal, servicemen and women earn a certain medal and are also forever labeled as a recipient of that medal. For instance, one does not "win the Silver Star," one is a "Silver Star recipient" or has "earned" a Silver Star. The below decorations are shown in order of precedence. Army awards and decorations are approved according to the guidance contained in Army Regulation 600-8-22: Military Awards. Rules for the proper wear of Army awards and decorations can be found in Army Regulation 670-1: Wear and Appearance of Army Uniforms.